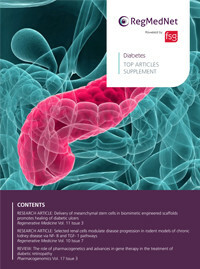 Download, save and read popular articles on diabetes, highlighting key research and thought leadership, with two original Research Articles and a Review. This month you can download popular articles on diabetes, highlighting key research and thought leadership, with two original Research Articles and a Review. Research Article by Roland Assi, Trenton R Foster, Hao He et al. In the first article of the PDF supplement, using mesenchymal stem cells contained within a biomimetic rolled collagen scaffold are investigated as a tissue engineering approach to diabetic ulcer wound care in a study by Alan Dardik et al. from Yale University, UCL and Central South University, resulting in improved wound healing in a mouse model. Research Article by Andrew T Bruce, Roger M Ilagan, Kelly I Guthrie et al. The next article in the supplement identifies the mechanistic pathways of selected renal cells delivered as therapy for rodent models of chronic kidney disease – a disease most commonly caused by diabetes. Andrew T Bruce et al. from United Therapeutics conclude that the approach effectively promoted resolution of chronic kidney disease-related etiologies through modulation of the NF-κB signaling pathway. Review by Aniruddha Agarwal, Sally A Ingham, Keegan A Harkins et al. The final article in the supplement, a Review by Dong Nguyen et al. 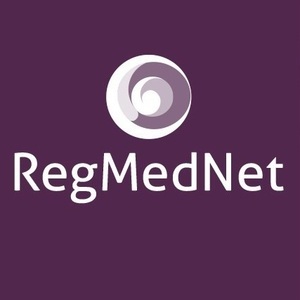 from University of Nebraska Medical Center, discusses the role of pharmacogenetics and advances in gene therapy in the treatment of diabetic retinopathy, including anti-tVEGF agents.